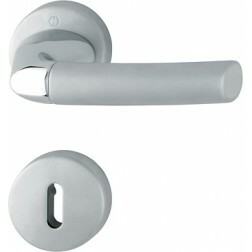 Interior door handle Hoppe Bruxelles series on round rose. Bruxelles Series, fascinating design and two-tone finish. The handle is distinguished for her matte effect, very pleasant to the touch. It's a quick and easy installation, just need a little DIY practices. The Quick-Fit Connection guide can be useful to you if you need. The two-tone finish is a perfect "habit" for this handle. Matte and polished effect creates a nice harmony between them pleasing to the eye. The surface of Brussels series is protected from erosion, spending time and dirt especially.